For a long time the New Residence was not only the town’s largest secular building, it was also its political hub, and today it is still the crowning architectural feature of Bamberg, visible from afar on the Domberg together with the cathedral. It is thus also the focal point of the old town of Bamberg, a UNESCO World Heritage site. It became what it was not by chance but primarily through political determination. From the mid-16th century the cathedral chapter opposed the building of an residence appropriate to their status as the official seat of the prince-bishops. They had to resort to living more or less in private in their own canon’s houses. 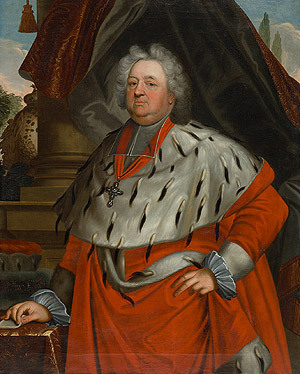 It was not until the reign of Prince-Bishop Lothar Franz von Schönborn (r. 1679-1729) that a representative new building could be politically enforced after Schönborn also became the Elector and Archbishop of Mainz in personal union in 1695. But unlike other princes who built shortly afterwards and his relatives in office in Würzburg or Bruchsal, Lothar Franz von Schönborn did not site his palace in the countryside far away from the cathedral, surrounded with formal gardens. From 1695 to 1703, Schönborn and his court architect Leonhard Dientzenhofer (1660-1707) planned and built an ultra-modern three-winged complex which turned the cathedral square into a cour d’honneur and visibly incorporated the cathedral as the fourth side of the square into the power structure of the bishop’s residence. This design remained substantially unchanged, in spite of subsequent alterations in the plans and the addition of a wing that was to replace the Old Court but was abandoned at the planning stage in 1703. To ensure the urban highlight on the Domberg did not remain in isolation, the prince-bishop began to change the medieval town, which consisted of various virtually separate centres, to modernize and align it with the power centre. Because uniform development according to symmetrical principles was not possible, it was decided to create a Baroque city axis from the Nuremberg-Leipzig trade route east of the town to the prince-bishop’s palace. To achieve this, the streets were carefully systemized by harmonizing the façades, adding striking buildings, creating vistas and accentuating the roofs in colour. What is remarkable is that both the succeeding prince-bishops, Friedrich Karl von Schönborn and Adam Friedrich von Seinsheim, retained the idea of the Baroque town axis in Bamberg almost to the end of the 18th century and gradually added to it. When the New Residence was built from 1695 to 1703, the three-winged complex was ultramodern. Only a few years before, Seehof Palace and the palace in Aschaffenburg had been built as four-winged fort-like complexes. Nevertheless, the New Residence in Bamberg still has many features in common with four-winged palaces with respect to the storey structure, the distribution of the suites of rooms and the staircases. For this reason it can be seen more clearly than in any other palace how the transition from the four- to the three-winged complex was accomplished. 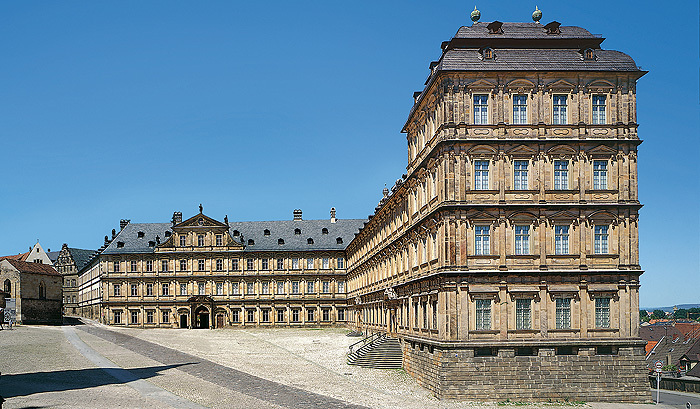 This is also why the building ranks as the first large Baroque residence in Franconia. On 1 June 1815 the Bamberg Residence was the scene of one of the final episodes of the Napoleonic era: Louis-Alexandre Berthier, a marshal of Napoleon who was in danger of falling into the hands of the advancing Russian army, committed suicide by jumping out of one of the upper windows. A plaque in the middle of Residenzstraße commemorates the event. 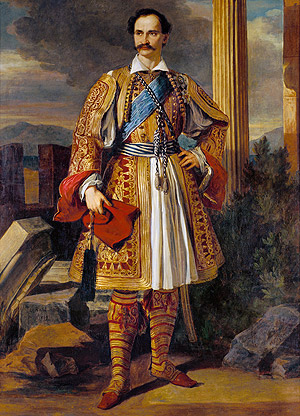 The abdicated Greek royal couple Otto I and Amalie lived in exile in the residence from 1862 to 1867 or 1875 respectively. The New Residence featured briefly in Bavarian history on one further occasion when the elected government under Minister-President Hoffmann and the Landtag (state parliament) moved to Bamberg.